Solid Filled - Inverted Channels - Separations That Look Completely Wrong! This can happen after using one of the Custom Color Channel Actions of UltraSeps to generate a specific color channel(s) for a separation, followed by running a new automated color separation such as Simulated #3, or whatever on another file. After doing so, its now possible that one or all of the channels are filled as a solid or appear inverted. This "might" also happen after running Index Separations followed by running a new automated separation on another file. This occurs due to an Invert function of Photoshop not responding properly in modern Photoshop versions. The Custom Color Channel Action, which makes use of Color Range instructs the end user to select Invert. If then one of our Actions makes use of Color Range for only a single purpose, this can impact the entire separation resulting in solid or inverted channels. Although our scripts do contain a command to reset Color Range to its default, newer versions of Photoshop (Creative Cloud) do not respond to it. Simply restart Photoshop and the issue will be resolved. Restarting Photoshop will reset the Invert function to its default value. 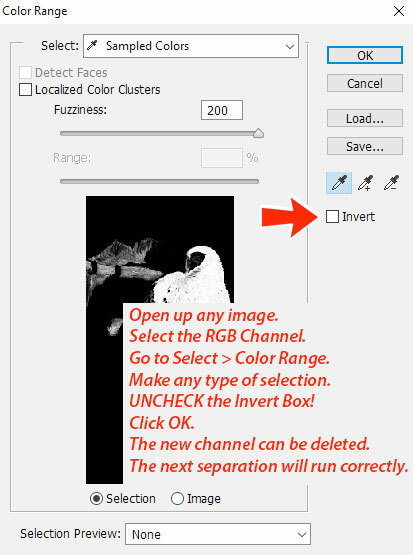 Another way to resolve this is to make a new channel using Color Range and to make sure to uncheck Invert prior to clicking OK. Any type of channel can be made with any type of selection. The primary goal is to uncheck that Invert check box. 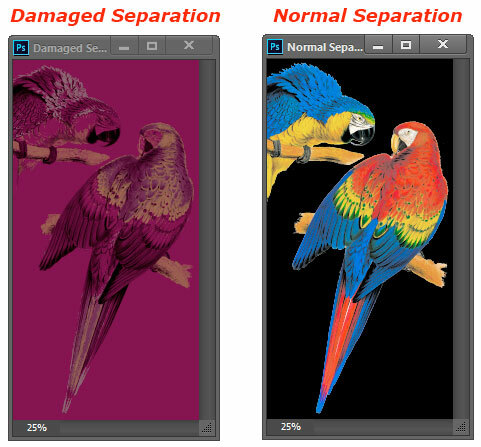 See images below for an example of a damaged separation compared to a normal separation. Also shown is how to get Photoshop working again properly without restarting by resetting the Invert Check Box of Color Range. If none of the above works, the Preferences File of Photoshop is damaged. Click here for instructions on how to reset the Preferences.